James Schramko here, and welcome to Marketing News this week. One of the best ways to get in front of a prospect is to send them a personalized video. I use a service called Wistia, and that is like a private YouTube video hosting account. I simply upload a video, whether it’s a face-to-camera, like this, or whether it’s a PowerPoint, which I’ve recorded with screen recording software. I load it up to Wistia, it encodes it for me and it sends me a nice link, so I send the link to the person I want to speak to, and they just click on the link and they get to see my video in a nice, branded player. Now the best news for you is that Wistia have just released a free program so that you can actually access this service for no dollars down. Try it out, if you like it you might get a paid account, which is what I have. But I think you’ll find the personal cut-through of sending a video is certainly a higher impact than just sending an email. And it’s especially good for following up people who you’ve already spoken to so they’re looking out for this communication with you. One of the best ways to build a quality customer list is to start off with small-priced offers and the best way to get small-priced offers is to break down big products into little products. This is called a self-liquidating offer. What you do is you take this small product and then you start buying traffic to that product and you make it convert, and as long as you can balance it out, as long as you earn enough to pay for the advertising, now it’s self liquidating. So you’ve effectively started to build a customer list, who are highly qualified, proven to spend, and they already like what it is that you have, and because your product is a smaller product of a bigger product, then it makes sense that you could sequentially follow that customer up and offer them the bigger product. So, now your neutrally-geared customer list is actually highly qualified, but it didn’t really cost you anything to get because you made profit on the way to buying that list. A really nice way to create self-liquidating offers is to run paid webinars or to create webinars for existing customers and then let that webinar go out to prospects. So you could put it on a private page perhaps, with a Wistia player, and that allows you to track and to determine if someone watched the video or not, you can actually pass variables, like email addresses, to that video and track individual use. But the best thing is, you can take something you’ve done once, like a webinar, using GoToWebinar, and you can then leverage that, time and time again, by putting it into a sequential follow-up. So the tools that I’m using to do this are GoToWebinar, Wistia for the video and Office Autopilot for sending the emails. Now this combination is a wonderfully leveraged way to build your customer list to offer great value, and to create a business that will run without you, which is something that was important for me, and it’s a great leverage tool. When you’re trying to persuade someone, a great way to do it is to use a story, a metaphor, if you like. Now I guess people can place themselves inside the story and understand the meaning of the story without you having to spell it out in simple sales language. So, if you want someone to take the middle option, you might weave a story like Goldilocks, where you have the porridge that’s too hot, and the porridge that’s too cold, and then there’s the porridge just in the middle, the one that’s just right, so that would be a metaphor for taking the middle option. So metaphors are very powerful, you can use metaphors all through your sales languaging, and it helps people understand what they should do. One of the most famous sales metaphors is the sliding doors one, where they tell the story of two people. One person took the right path, one person took the wrong path, and the answer is obvious – you should be the person that takes the right path, therefore buy whatever product is offering this. So it was one of the most famous case studies, and that metaphor out-converts almost any other type of sales technique. 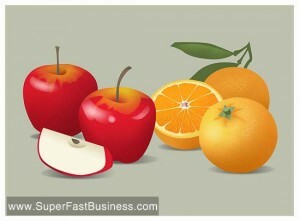 When you’re in a position where someone’s comparing what you’re offering versus someone else, you want to create an “apples versus oranges” comparison. You want your offering to be so differentiated that it’s almost impossible to compare, and when your offer is differentiated to that point, now it is a one-horse race. So don’t commoditize yourself by giving the same stats and comparison points as everyone else – make it different. I remember when I used to go shopping for a mattress, and I tried to compare mattresses between stores. None of them had the same mattress. In fact I found out later that the mattress factories were creating a different product line for each of the major retailers so that customers couldn’t actually compare or shop between them and everyone had their own differentiated offering. It’s a good strategy, and you might try that in your business. When you have your own team, one of the best things you can do inside your team is to start benchmarking. When you have two or more people doing the same job, get some key performance indicators that you can measure. And when you track those and you see different results for the same task, you know that someone’s performing on the high level, someone’s performing on the low level, and then there’ll probably be people in the middle. What you want to do is identify what’s causing that high level of performance. And you take that high level and you get that person to train everyone else, and hopefully your entire average will lift. And you’ll also look to what is causing that very low output, and quite often you’ll find a problem that can be fixed easily. See what sort of ratios they’ve got. In most businesses, for example, when I came from the motor industry, they had benchmarks for every motor dealership. The average profit per motor dealership was about 2%, and there was roughly one million dollars’ worth of sales turnover per person that was employed. So these were some of the benchmarks that we knew, and it made us more aware of how to make good decisions, because we could tell instantly if something was well and truly good or well and truly bad, and make sure that we could fix the anomalies. Identify something in your business that you’re doing really well, and make an action plan to do more of it. So scale up your wins, do more of what’s working, and you’ll find that your business will grow more profit faster. I look forward to catching up with you next week.